La Jolla beachfront 2 Bedroom G301 sits on 7 miles of white sand beach and is centrally located to grocery stores, bars, and restaurants. Downtown San Jose del Cabo is only 5 minutes away and with a short 15 minute drive you are in Cabo San Lucas. 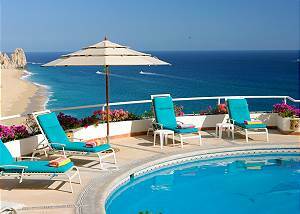 This Las Olas 2 Bedroom 2 Bathroom beach front condo has amazing views of the Sea of Cortez. Relax on the deck after a hard day of ocean fun while watching whales pass by. 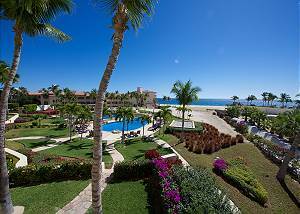 Located in the Mykonos Bay Resort, this is a true beachfront condo with amazing views of the white sand beach of Costa Azul all the way to The Palmilla. Mykonos has two large pools, a kids wading pool, and an adult only hot tub. This 3 bedroom condo offers 180 degree ocean views and sits on one of the most pristine beaches of Los Cabos, with swimming, surf, and 7 miles of white sand beaches outside your front door. This beautifully decorated 2,174 sq. ft. 2 Bedroom/ 2 Bath corner unit has a large living room and dining room which separate the bedrooms and an over sized terrace. Walking distance to everything including the beach. Ocean Views. Las Mananitas 4301 is luxury at its finest. 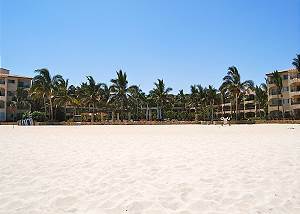 Located on the San Jose coast of white sand beaches, this condo is walking distance from stores, restaurants, and beach front bars. 5 minutes from San Jose del Cabo and only 15 minutes from Cabo San Lucas. This beautiful petite 3 bedroom/ 3 bath Villa is located on the front side of the exclusive Pedregal of Cabo San Lucas and is within easy walking distance to downtown Cabo San Lucas. This beautiful Porto Bello 3 bedroom villa has an excellent location on a 7-mile white sand beach in the heart of Costa Azul in front of three surf breaks. Located 1 block from Medano Beach, the most popular beach in Cabo San Lucas, Casa Bonita is walking distance from shopping, stores, restaurants, and clubs right on the beach. This is the place for those who want to be close to everything. Just three blocks to the Cabo San Lucas marina, two blocks from Medano Beach, and two blocks from down town San Lucas, this Casa is the perfect place for those who do not want to drive during their vacation. 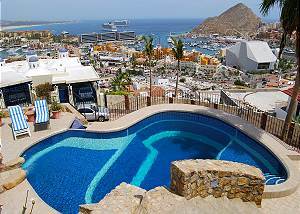 Really amazing home built on a lookout overlooking the entire downtown of Cabo San Lucas and the marina including the back of the tip of Baja. Incredible views is an understatement. Casa Ungero is the most amazing four bedroom eco friendly solar powered home in ALL of the gated community of Laguna Hills. Laguna Hills is the gateway to the East Cape where you will find endless adventures on either the land or in the Sea of Cortez. A rare find on the beaches of San Jose del Cabo, this charming beach front 3 level Villa has a 7-mile white sand beach in its front yard with spectacular point to point ocean views of the Sea of Cortez. 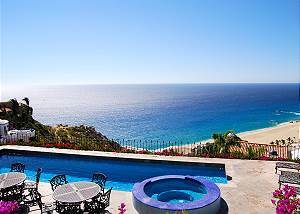 This magnificent Villa has one of the most spectacular views in Cabo San Lucas, has 4 separate sleeping quarters with private entrances, and the pool is cantilevered over the beach to take advantage of the location and a jacuzzi. A Golfer's paradise! This 5000 square foot luxury Villa with 4 Bedrooms and 4.5 Bathrooms sits in the prestigious private gated community of Puerto Los Cabos in the middle of the latest Jack Nicklaus 18 hole golf course. 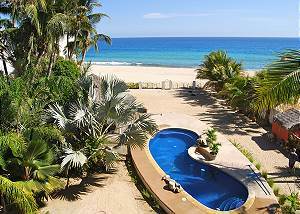 Villa Pacifico del Mar is a large and spacious house that boasts 6,800 square feet, containing 9 bedrooms and 9 bathrooms. 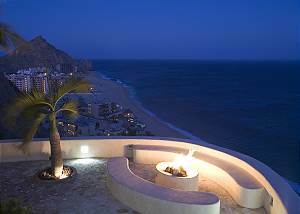 The home is built into the cliff side of the Pedregal overlooking the Pacific Ocean and the back of the world famous Cabo Arch. 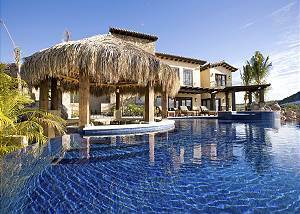 This exquisite 7 bedroom/ 7.5 bath Villa has the ultimate location on Chileno bay, the best snorkeling and swimming beach in Los Cabos. 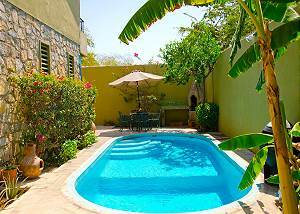 10 minutes from Cabo San Lucas and 20 minutes from San Jose del Cabo. 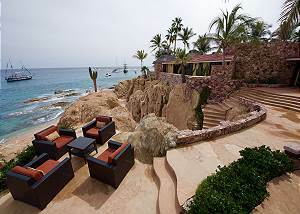 Dramatic cascading water walls and amazing ocean views greet you as you enter Villa Buena Vida in Cabo San Lucas. Built on a cliff with unobstructed views of the Pacific Ocean and Finisterra Beach below.